Here’s an idea to take to Hollywood. Take a large hole in the ground, where nothing is happening except a few people working to make it bigger. Take a bunch of talking heads whose professional expertise covers nuclear waste management and theology. Take a few moody landscape shots of snow and trees. Take some impossibly difficult questions and fail to answer them. Assemble all of that into a film and fill the multiplexes of the world. Well, perhaps not Hollywood, but it appealed enough to a bunch of Scandinavian funders to get made anyway. The film is Into Eternity, and it’s astonishing. You almost certainly won’t be able to see it, but if you can, you should. 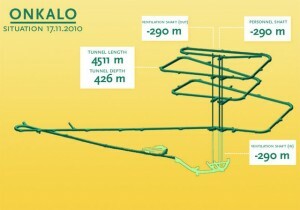 The Finns are digging a very big hole in which to store their nuclear waste. They won’t finish filling it up while any of us is still alive, but once it is full, they plan to fill in the hole and keep the waste secure for 100,000 years. To put it mildly, that raises some interesting questions. If a lion could speak, we would not be able to understand him. (which is a member of the same family as Thomas Nagel’s famous essay, “What is it like to be a bat?”) . Animals may be the obvious subject matter for such speculation, but the same issues surely arise with the distance of time. We would, I suspect, find it overwhelmingly difficult to communicate with an ancient Egyptian, with the language itself being the least of our problems. So what have we to say to the inhabitants of Finland four thousand generations into the future, and how on earth might we expect them to understand us? That’s one of the more interesting questions explored – but not in any way resolved – by the film. The practical question is simple enough: what is the best way of warning people that this is a dangerous area and not to be interfered with. Actually, though that’s slightly the wrong question. The real objective is not to warn people, but for the waste not to be disturbed, and the question then becomes whether it is better to attempt a warning or not to attempt one at all. Security through obscurity is a concept with a generally poor reputation, but this could just be the exception. To see why, start with the alternative approach, which is to put something in place which will both discourage people from digging 500m deep holes in just the wrong place and do so reliably for as long as is needed. What could that something conceivably be? And as important, if it fails – and we have to assume that it will – will it fail gracefully or destructively? Any attempted communication, it seems to me, has two components: the message content, and the fact of its being a message. Unless you can tell that the thing is intended to be a message, there is no chance of discovering its content, so you can’t have the message without its container. But it is entirely possible to realise that something is intended to be a message without having the slightest idea of what it is attempting to communicate. Indeed, it seems more likely than not that whatever form of symbolism is used to encode the message, the very best which can be hoped for is a distorted understanding. Even something as linguistically and culturally close to us as the works of Shakespeare carries that danger. The bits we can tell we don’t understand are one thing, but it is the bits we may think we understand but don’t – ‘caviar to the general’ – which are the more risky. So the difference between ‘there is something interesting here, dig until you find it’ and ‘there is something terribly dangerous here, keep away at all costs’ may be too subtle to be transmitted reliably. Nor does the idea of recoding the message for each succeeding generation carry much comfort. There is no telling how quickly ‘radioactive nuclear waste below, do not disturb’ becomes ‘send three and fourpence, we’re going to a dance’, but we can have no confidence that it will not be a long time before the 4,000th generation is reached. So what should the Finns do? I think they should plan for Onkalo to be forgotten, recognising that distorted forgetting may have some of the same dangers as distorted remembering. There are three basic scenarios with which they have to deal, only one of which is really dangerous. First, there may be some form of social and technical collapse, with all knowledge of nuclear physics gone and no awareness of radioactivity let alone any ability to detect or measure it. If that society has also lost other forms of advanced technology, digging through 500 metres of solid rock may be socially or technically beyond it. Unless there is something obviously valuable close to the surface, they would have no reason to start digging in the first place. There is no value to them in a warning: it could do no good, and conceivably be the only thing – the gift from the gods – that induced them to think of it at all. Then there is a scenario which is like the first but with advanced mining techniques and the social and technical capital to invest in large holes with uncertain returns, but with no knowledge of the dangers of radioactivity. That’s the only one where a warning might do some good, though the risk of its doing harm by attracting attention must be at least as great. Finally, it is possible that the march of technical progress continues. Then our successors will either understand the problem as well as we do and so will know enough to manage the risk, or they may know a great deal more and so be able to neutralise any harm in any case. They might benefit from a handy indication that feedstock for their 17th generation fusion reactor is to hand, but can probably work it out for themselves anyway. There is something a bit awe inspiring watching a bunch of distinctly ordinary looking Finns wrestle with a question with implications which ripple through millennia, and something a bit alarming about how far they have got into the construction of Onkalo without yet having a very coherent answer. It puts the suddenly slightly trivial seeming questions the rest of us deal with in fairly extraordinary perspective. So you should go and see the film. If you missed it in London and Cambridge, the current choices seem to be limited to Cardigan and Ludlow, but think of the journey time as a proportion of 100,000 years and it will be but the blink of an eye. Perhaps not surprising to discover that there has been a similar thought process in the USA, with the intriguing conclusion that art might be a more stable way of encoding messages than language, but with the same risk discussed in this post that the fact of a message persists much longer than its intent.